Let Dickens and the whole ancestral array, going back as far as the Greeks and Shakespeare, be superfluous reminders that both Griffith and our cinema prove our origins to be not solely as of Edison and his fellow inventors, but as based on an enormous cultured past; each part of this past in its own moment of world history has moved forward the great art of cinematography. As I write this, in Rochester, Kent, I can look out of my window at the corner of St Margaret Street where, ninety-nine years ago, John Bunny drove past in a carriage, dressed as Mr Pickwick for the turning camera handles of the Vitagraph Company of America. And yesterday and today, on BBC television, we saw a fevered The Mystery of Edwin Drood, much of it filmed fifty yards away in the grounds and centre of Rochester cathedral. Here is the heart of Dickens, and the heart of a grand cinematographic tradition. Charles Dickens was born two hundred years ago, and his great legacy is being celebrated with books, exhibitions, festivals, conferences, programmes and film seasons. His superabundant influence on cinema and television has been recognised in particular, with a three-month film season at the BFI Southbank underway, an Arena documentary Dickens on Film (with copious examples from the silent cinema) and new television productions of Drood and Great Expectations. Dickens remains something to see. Dickens was hugely important to the silent cinema, as Eisenstein noted in his famous essay, ‘Dickens, Griffith and the Film Today’, which points out the principle of montage inherent in both Dickens’ novels and D.W. Griffith’s films. Every one of his novels was filmed during the silent era, most more than once. 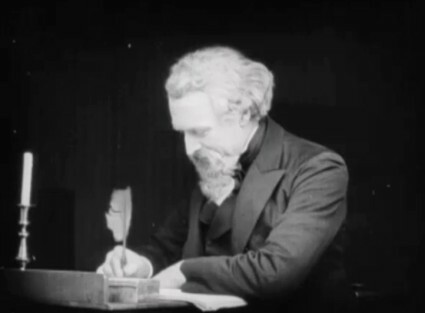 There were specialist Dickens filmmakers, such as Thomas Bentley and A.W. Sandberg. Charlie Chaplin (perhaps the most Dickensian of all filmmakers) loved his works, reading Oliver Twist many times over. It was not just Dickens the novelist who inspired the first filmmakers but Dickens the lover of theatre and the many stage dramatisations of his work. Dickens’s work naturally spilled out of the pages that could not fully contain them onto other dramatic platforms – the stage, the recital, the magic lantern, the cinema. Like all good works of the imagination, they transcend the boundaries of any one medium. As a contribution to the Dickens bicentenary, and by way of demonstrating his great importance to early film, we have put together a filmography for Dickens and silent cinema. It may be the most extensive yet published; it certainly tries to clear up some of the confusion to be found in listings elsewhere, though there are still problematic corners, and doubtless films still to be identified. It lists both fiction (arranged under the works that inspired them) and non-fiction films, and notes where films still exist (as far as I can discover), and if they are available online or DVD. Where it says afilm is lost, this should not be taken as definitive, as some films will be held privately (noted here as Extant where I have information on these). Please let me know of any errors or omissions. Note: Drama about a poor mother and her daughter, who performs in a stage production of Oliver Twist. Length: 1 reel Archive: Lost? Note: The first two episodes (which were also shown together as a two-reeler) were released February 1913, and the third episode in September 1913. 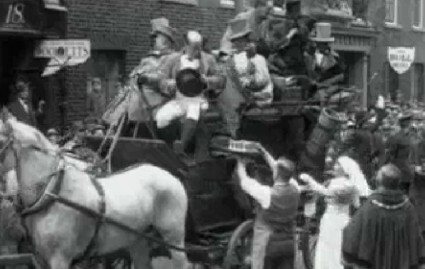 Some sources give a Barnaby Rudge (USA 1911) directed by Charles Kent. Kent was working at this time for Vitagraph, and there is no record of such a Vitagraph production. Denis Gifford, in Books and Plays in Films 1896-1915, lists a one-reel Oliver Twist apparently made in Denmark in 1910, but no such production can be found in the online Danish filmography. Some sources list a German Oliver Twist directed by Lupu Pick in 1920, but this appears to have been a production announced but not completed. Magliozzi lists an American 1922 Scrooge held by UCLA, but this is probably the UK title from the Tense Moments with Great Authors series. The 1924 Bonzo cartoon Playing the Dickens in an Old Curiosity Shop (UK 1925) uses only Dickens’ title. The UK 1904 film Mr Pecksniff Fetches the Doctor has no connection with Martin Chuzzlewit. Americans Place Wreath on Dickens Tomb at Westminster Abbey (Gaumont Graphic	719) (UK 11-Feb-18) p.c. Gaumont / Newsreel / Archive: Lost? Dickens’ Fair at Botanic Gardens for Home for Blinded Sailors and Soldiers (Gaumont Graphic 783) (UK 23-Feb-18) p.c. Gaumont / Newsreel / Archive: Lost? Dickens Procession and Confetti Carnival – Southport (Gaumont Graphic 1184) (UK 27-Jul-22) p.c. Gaumont / Newsreel / Archive: Lost? Dickens Pageant at Camden Town. Famous Author’s Boyhood Home the Scene of Costume Carnival (Gaumont Graphic 1212) (UK 02-Nov-22) p.c. Gaumont / Newsreel/ Archive: Lost? Dickens Golden Wedding (Empire News Bulletin 43) (UK	27-Sep-26) p.c. British Pictorial Productions / Newsreel / Archive: Lost? Pickwick Club (Empire News Bulletin 109) (UK 16-May-27) p.c. British Pictorial Productions / Newsreel / Archive: Lost? This filmography is indebted to the American Film Index volumes, Denis Gifford’s British Film Catalogue and Books and Plays in Films 1896-1915, Ron Magliozzi’s Treasures from the Film Archives, the Silent Era website’s Progressive Silent Film List, Filmportal, the Danish national filmography, the American Film Institute Catalog for silent films, the Pordenone Silent Film Festival’s Vitagraph Company of America catalogue, the BFI Film & TV Database, News on Screen, the IMDb and other sources. Only when I had exhausted these did I turn to the filmography in Michael Pointer’s Charles Dickens on the Screen. This had two or three titles that had eluded me, a number of film lengths that I hadn’t tracked down, and all in all is a fine piece of research. I commend it to you. Update (12 February 2012): My thanks to friends at the BFI for some corrections and additions now made to this filmography. Thank you for the filmography. I’ve been looking forward to the Dickens anniversary. Turner Classic Movies in the US ran many Dickens movies during December, for some reason. I don’t remember any silents. US – 49 – this includes the only versions of Martin Chuzzlewit. The book features a long section describing the hero’s visit to the US. The Americans are shown to be awful people. Germany – 2 – this includes a version of Little Dorrit made during WWI. A good choice for anti-British propaganda. Thanks for the statistics, Joe. It’s certainly interesting to see that American tackled Martin Chuzzlewit, despite its views of the country (which Dickens subsequently apologised for in an epilogue). Dickens is by far and away the most adapted of classical novelists in the silent era (Alexandre Dumas comes second), but he’s not the most adapted writer – that honour goes to James Curwood, at least for the period 1896-1915 – see https://bioscopic.wordpress.com/2008/05/02/pen-and-pictures-no-2-the-most-popular-authors/. Re your TCM point, I’ve checked how many extant complete feature films there are: eight (2 USA, 3 UK, 3 Denmark). And another statistic – of the 103 fiction films, 69 are lost. I only have circumstancial evidence for saying this, and I wish I could remember who initially told me that it was a theory they had…..it may even have been you, Mr Urbanora…..but the actor playing Scrooge in the 1901 Marley’s Ghost could well be Seymour Hicks. Going through the newspapers of 1901, the only ‘legit’ London production of the tale that year was at The Vaudeville, starring Mr Hicks; in November the company performed the playlet (it ran less than an hour) at Sandringham for Queen Victoria…..and I was told by my forgotten source that a catalogue entry for the 1901 film advertised it as being ‘As Performed before her Late Majesty’ or words to that effect. Without naming the cast…..but then this was 1901. Finally, if you compare the face of ‘Scrooge’ in the frozen frame of the video to a picture of the Hicks of that era….. http://www.collectorspost.com/Signed/SH2.jpg ….but has anyone got hard and fast evidence ??? Except that it would have been the unlate Queen by November 1901….I may have misremembered that part!! I note that in many of the earlier versions of Oliver Twist, an actress is playing Oliver–was that a stage tradition, a la Peter Pan, or an ad hoc casting decision by a producer who needed a small actor? In the 1910 J. Searle Dawley Christmas Carol, is that supposed to be Viola Dana, rather than Violet? Thanks for this extensive filmography. Penfold – it’s highly unlikely to be Seymour Hicks. Firstly if Paul had secured someone of Hicks’ great fame, he wouldn;t have kept quiet about it; secondly, he’s too chubby-cheeked to be Hicks, who did make a Scrooge film in 1913, however. Joan – I noted the actresses playing Oliver too. So far as I know there was no such tradition, but I don’t know much – such sources as I have on Victorian theatre are silent on the matter. There a broader tradition of petite actresses playing boys (e.g. Mary Pickford) and the British pantomime tradition of actresses playing the leading man (‘principal boy’). It should of course be Viola Dana – I’ll correct it. Update: Jona, I should have considered your query more closely. Reading Edward Wagenknecht’s The Movies in the Age of Innocence recently, I found that he notes that Marie Doro had played Oliver on the stage before making the 1916 film. There is quite possibly a stage original behind some of the other films with actreeses playing boy roles, though I haven’t investigated this. Another stage tradition to note is Peter Pan played by a woman – with Betty Bronson in the 1924 film, of course. Allow me a correction or two Luke, but both the BLEAK HOUSE and the SCROOGE from the TENSE MOMENTS WITH/FROM GREAT AUTHORS/PLAYS exist. I have them both, and most of the series, which was released in America by the Weiss Brothers, reside in the Kit Parker Collection materials housed at UCLA and the Academy. Their version of HUNCHBACK OF NOTRE DAME was on the WEISS-O-RAMA Collection Kit and I put together for VCI. Richard – it is good to be wrong. I did expect some challenges to my assertions that some films were lost, and this also probably explains the 1922 Scrooge listed in Ron Magliozzi’s Treasures from the Film Archives as being held by UCLA. I did look at the UCLA catalogue but didn’t see the film there. I’ll correct the the filmography, stating that the films are extant. Oops, one more correction, I have a print of the Edison MR PICKWICKS PREDICAMENT (1912) as well. And the 1923 CRICKET ON THE HEARTH also survives complete and was available from Blackhawk Films in 8mm and 16mm in the 70’s. Many thanks again Richard – I’ll note these on the filmography. As you may have gathered, I got my lost or otherwise information from public film archive holdings. Many thanks for sharing this excellent filmography! Do you agree that this may be the 1912 Thomas Bentley version? I’ve never come across this one before, and find the opening scene of Agnes’ death truly remarkable. I’d love to know what other readers think! No, that’s the Vitagraph version from 1909, also held by the BFI. The company’s V logo appears on the titlecards and on the sets. Thanks for the link, which I’d missed – and the kind words. Thanks very much for this clarification on the Pathé clip. I see now that this Vitagraph “Oliver Twist” is also included in the BFI’s “Dickens Before Sound” dvd set. Thanks again for your hard work on this filmography!